PORTABLE LIGHTING LED HAND LAMPS are most commonly used in confined space entry applications, tank and vessel entry. There are to standards that are used, Explosion Proof Class 1 Division 1 Groups, CD-FG and Water-Vapor proof rated Nema 4x Water proof. Portable Hand lamps are available in a wide variety of portable products, First they come with 120v or 12 volt operating systems. 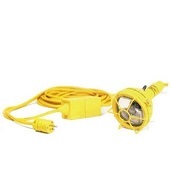 Single hand lamps come with a option of cord lengths and plug brands. Bulbs are LED, Incandescent, and Fluorescent. When using 12 volt bulbs clients has options of single in-line 120v to 12 volt transformers or a mix of multiple outlet low voltage lighting transformers. These systems come in weather proof enclosures or explosion proof enclosures, floor stands or cart mounted. 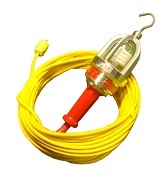 One of the largest usage of hand lamp products is for the assemble of portable string lights. Systems where multiple hand lamps can be wired along a single power cord. 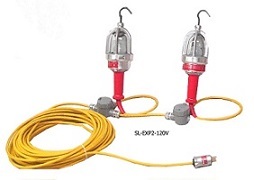 Boss offers string light systems in Explosion proof and Water-vapor proof ratings both 120v and 12o volt systems. Construction of string lights allows for the assemble of hand lamps every 10 feet with each hand lamp having a three foot lamp drop cord. String lights are designed with an extra length of trailer cord measured from the last hand lamp on string to the power plug. 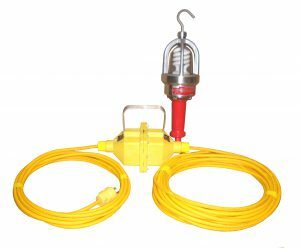 This trailer cord allow operators to install string lights with enough power cord to be able to plug in system outside tank or vessel. Bossltg is a UL Certified Electrical Assemblers. We have the professional qualifications to assemble string lights to our clients specific requirements. PORTABLE LIGHTING LED HAND LAMPS are always in stock for immediate shipment from Bossltg two locations: Baton Rouge and Sulphur, La.